Fancy hard-boiled eggs, that’s my definition of deviled eggs or eggs mimosa. 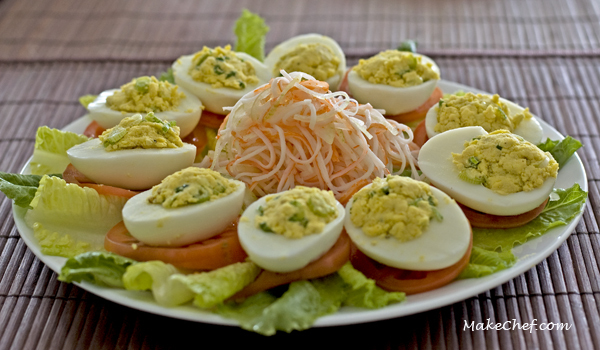 The hard-boiled egg yolk is mixed with various ingredients and piped back into the egg white. I did not pipe the egg yolk mixture but simply used a spoon to fill the egg white. If you want ‘cuter’ deviled egg, then you might want to pipe the egg yolk. Usually the egg yolk is mixed with mayonnaise, but in this recipe I used olive oil for a lighter version. Remove the egg yolk and mix with mustard, olive oil, green onion, salt and pepper. 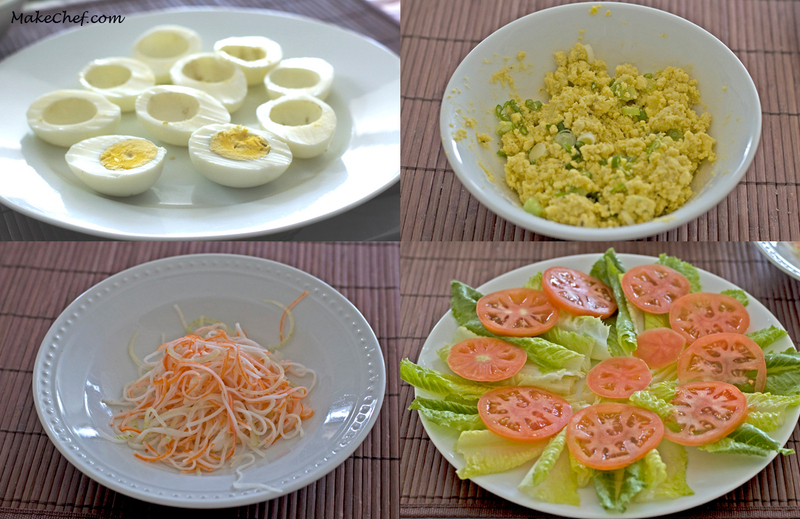 Fill the empty egg white with the egg yolk mixture and place the deviled eggs onto the slice of tomato and lettuce. Place the imitation crab meat in the centre of the dish. Serve cold as appetizers. This entry was posted in Appetizers, Egg, Recipe and tagged deviled, egg, imitation crab meat, salad.